On September 19, 2011, when golden leaves were swaying in the breeze in the nice and cool early autumn in London, Freemasons' Hall was bustling with fashion elite, popular media, senior buyers, retail giants and celebrities from all walks of the society. They lingered on at the booths of ELLASSAY, OMNIALUO, EITIE and other well-known fashion brands in Shenzhen and looked forward to the pleasant surprise brought by the "Fashion Shenzhen" event to London Fashion Week. Ambassador Liu Xiaoming and Madame Hu Pinghua visited every booth in the accompany of Ms. Shen Yongfang, President of Shenzhen Garment Industry Association, and Ms. Liu Jin, Deputy Director General of Shenzhen Municipal Commission of Science, Industry, Trade and Information Technology. Some of the exhibited brands focus on innovative Chinese garments, presenting graceful and classic cheongsams or Tang suits; and others specialize in popular Western-style clothing, exhibiting elegant dresses or suits. Some emphasize environmental protection while others stress innovation; and some boasted select fabrics while others showcased their avant-garde colours. Ambassador Liu and Madame Hu listened to the introductions of the exhibitors and designers on their participation in the exhibition. 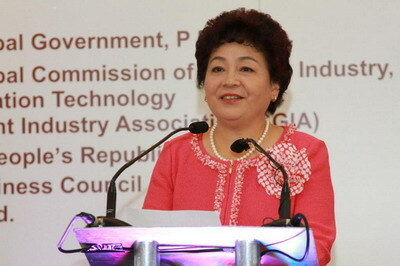 Ambassador Liu said that although this was the first debut at an international week for many brands, they have won recognition from their foreign counterparts. All the exhibited garments, regardless of their distinctively different styles and fabrics, are fashionable and well-made. They are the pride of the fashion industry in both Shenzhen and China. The Ambassador encouraged the exhibitors and designers to pursue excellence and to enhance the brand of "Fashion Shenzhen" together. After that, the presentation of Shenzhen fashion industry officially started. Ambassador Liu first delivered a speech. He said that today, London with a long history and Shenzhen as a young city are coming together because of fashion. Shenzhen is well-positioned to be China's ‘fashion and creative capital’ because: first, Shenzhen is a young city with the strength, energy and spirit of a young population. In turn from that youth a creative zest has flourished and thus creativity is always the defining character of Shenzhen. Second Shenzhen is a tireless pioneer. The city has always been a trail blazer for China. Its leadership in China's economic reform is recognized as "Shenzhen Speed" and this speed of development and incredible growth are the trademark of the city. It is in Shenzhen that the Chinese people were first exposed to the fashions and dressing styles in the West and in turn Shenzhen absorbed these trends and spread these global fashion influences across China. Third, Shenzhen is advancing as a highly cosmopolitan city. Here, eastern and western cultures and ideas blend and inspire each other. It is now a melting point of creativity that has formed a diverse and unique Shenzhen culture. Ambassador Liu said that Shenzhen is a window into today's China. The country has reinvented herself through more than 30 years of reform and opening-up. China is committed to continued national development and rejuvenation at home and helping create a more peaceful, prosperous and harmonious world. This is the 4th time ‘Fashion Shenzhen’ has been held in London, a world fashion city. The event will continue to be a showcase for Shenzhen's fashion industry. In turn it is a great opportunity for Shenzhen designers and manufacturers to be exposed to the influences of international markets and world fashion trends. The Ambassador expected the event to show China’s rich, inclusive cultural heritage, boost China-UK commercial relations and strengthen the understanding and friendship between the two nations. Finally, Ambassador Liu wished "Fashion Shenzhen" a great success. In her speech President Shen Yongfang expressed her gratitude to Ambassador Liu and the Chinese Embassy for their long-term support which helped "Fashion Shenzhen" to be held at London Fashion Week. She said that Shenzhen is leading the fashion industry in China and the designers in the city are casting their eyes to the international fashion arena. As "Fashion Shenzhen" has been held at London Fashion Week for four years, the fashion industry in Shenzhen has been better understood and has attracted more attention. Ms. Shen hoped that "Fashion Shenzhen" would have a broader space for development through the unique charm of "Shenzhen design". 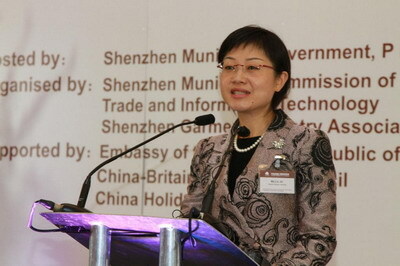 Deputy Director-General Liu Jin delivered a toast on behalf of Shenzhen Municipal Government. She welcomed the distinguished guests to "Fashion Shenzhen" and said that Shenzhen leads the fashion industry in China with its energy, enthusiasm and innovation. She hoped that the "Fashion Shenzhen" series of activities including brand presentations and fashion shows would help more and more international friends to understand and visit Shenzhen and would promote the business and cultural exchanges between China and the UK. While the dinner was going on, another exhibition hall at Freemasons' Hall has been crowded with journalists and enthusiastic spectators. Ambassador Liu and Madame Hu went to the fashion show venue and took front row seats together with the delegation from Shenzhen. Under the flashlights, the "Flower Fairy: Quran and Chinese Red" series were first presented. They were the works of Ms. Dang Hao, a top 10 fashion designer in China, in collaboration with her daughter, who graduated from the Central Saint Martins College of Art and Design. The unique process of knitted fabric textures created by Deng Hao ingeniously combines knitted and tatted fabrics and thus enhances the diversity of knitted garments. Inspired by the structures of the China Pavilion at Shanghai World Expo and the traditional Islamic architecture, the works dazzled the spectators with their designs blending the traditional Islamic patterns and ancient Chinese architectural structures, sharp contrast of "red and green" and infinite ethnic charm. After that came the works of Mr. Xie Haiping, who has been hailed by the European fashion media as "China's Issey Miyake". 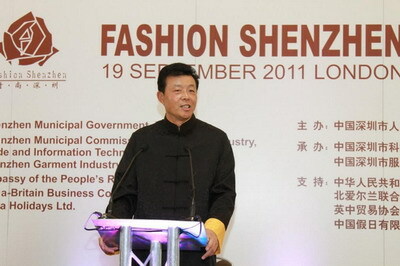 Mr. Xie has attended London Fashion Week on behalf of Shenzhen twice. His gorgeous Chinese style has attracted great attention from the international fashion world and his design is getting more and more popular. This year his exhibited works are inspired by the emperor's robes and court dresses in the Qing Dynasty in China. Being reorganized by the designer, the ancient patterns resumed their splendor and showed the unique charm of Chinese elements. Though constantly turning their lens, the photographers seemed to find it difficult to capture the movements of the Chinese and foreign models who presented the brilliance of the shining clothes. After another round of flashlights, the music suddenly stopped and the light dimmed. The thunderous applause burst among the spectators told everything: the young designers from Shenzhen, a young city in China, ignited the flame of Chinese fashion with their energy and passion and impressed the audience in London, the fashion capital. The "Fashion Shenzhen" event is a successful exchange between the British and Chinese creative industries and a close cultural contact between the two countries. Although the event is coming to an end, Shenzhen and London - the fashion capitals in the East and the West, will meet again next year.